This picture was posted to Facebook by one of my mom’s cousins. It’s my mom’s mom’s parents. 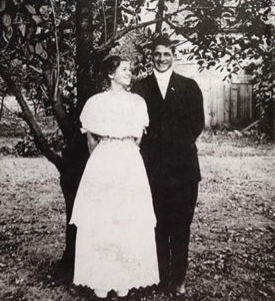 According to my mom’s cousin, the photo was taken August 9, 1914 of Freda Jane Roadruck and Alonzo (Lon) Pickering. They were married the following November 12th. I remember meeting both of them when I was younger and I attended the 100th birthday celebration of my Great Grandpa Pickering in St. Anne, Illinois.